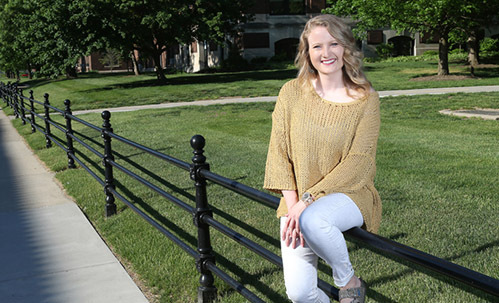 Dottie Vollmer arrived for undergraduate study at Indiana University with a biochemistry major in mind. She now laughs that few genes from her mother, a chemical engineer, apparently transferred to her in that area. Instead, Vollmer re-thought her 4-H experience and longstanding interest in youth before choosing IU's then-new youth development program in the Department of Applied Health Science. She worked during school breaks in the Fountain County Extension office for five years, which helped her realize the scope of Extension work year-round outside of the county fair. It also confirmed for her a career plan that involved guiding and influencing others. At IU, she became a peer educator who mentored students in their transition from high school to college and on financial matters, and in helping others, found her own strengths: "I went from being overwhelmed to being excited about finishing college," she says. Purdue was a natural next step for her, she adds. Associate Professor of Agricultural Sciences Education and Communication Levon Esters' research in career development meshed well with her own interests, and she began a master's degree program under his advisorship in August 2016. 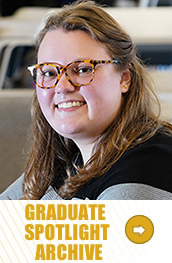 Vollmer also became the campus activities coordinator for Mentoring at Purdue (M@P), a program to enhance graduate education for women and underrepresented graduate students in the College of Agriculture. For her capstone project, Vollmer spent the last two years developing a resource for undergraduates who intend to seek graduate school admission. M@P-ing Out Your Future: Pre-Graduate Resource Guide covers the process from preparing for graduate study as early as the freshman year, to taking the GRE, to writing a statement of purpose, securing recommendations, and funding. "I honestly think that I would have used it myself as an undergraduate," she says. Other institutions are currently reviewing it, and students who weighed in on a survey were "positive that this is going to help people," Vollmer says. "I didnt realize I would l leave this mark on Purdue," she says of its expanding distribution. The guide is an outgrowth of M@P, but Vollmer believes a wider range of students in and outside of Agriculture can benefit from it. Esters provided his broad perspective and input based on students he has worked with, she notes. "I'd like to think that I'm self-sufficient, but he's been there to encourage me. He knows that Im going to get the job done but will keep me motivated." In preparation for her August graduation, Vollmer has trained her replacement in M@P and hopes to find a job in student services. Having worked with young children, then middle and high schoolers, she now would like to capitalize on the skills she learned through M@P to focus on undergraduates. "I'm very interested in career development," she explains. "Based on my own transition, I've realized how important it is for students to find a career that fits their personalities, strengths and goals." In her spare time, Vollmer coaches the cheer squad at her hometown high school, makes quilts and enjoys an occasional Netflix binge.